When my dear husband found out that I was using leftover Easter candy to make something called Snickers pie for tonight's baking session, he asked "Isn't that a bit Sandra Lee"? (For those who haven't heard of Sandra Lee ["SL"], she has a show on the Food Network called "Semi-Homemade Cooking" although I think they use the word "homemade" loosely.) So to someone like me who actually cooks and bakes from scratch, this could be quite insulting. But my husband's comment was mere observation and I took no offense. 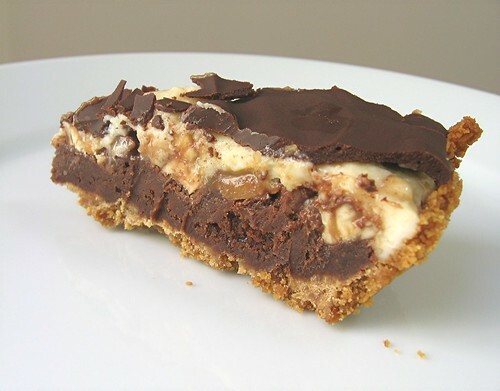 In fact, with a name like Snickers pie, I could imagine SL mixing together chopped Snickers candy bars, a tub of Cool Whip, a few cups of instant chocolate pudding, plopping the mixture into a store bought frozen pie crust, drizzling some chocolate liquor over it and calling it a Snickers pie. I mean, the lady does have a tendency to use a lot of candy and booze during the show, don't you think? Yes, it's true that the pie I baked actually has pieces of Snickers candy bars embedded in it, but that's where the resemblance to anything SL does ends. This Snickers pie has a crust, a fudge layer, a Snickers layer, a cheesecake layer and chocolate topping layer. But is my pie any more homemade than the imaginary SL pie I described? I'd like to think so. But then again, I didn't actually make my own graham crackers although I did crush the crackers with my rolling pin, mixed the crumbs with sugar and butter, pressed them into a pan and baked it. I'm not a dairy farmer so I didn't make my own cream cheese or churn my own butter. I don't have my own hens to provide fresh eggs. But I did make a fudge layer from chocolate, butter, eggs and sugar and a cheesecake layer from cream cheese, eggs and sugar. At what point can something be labeled homemade? Maybe the best I can say is that my pie is less not homemade than something coming out of SL's kitchen. Well, whether you call it homemade, semi-homemade or not homemade at all, this pie was good. A bit over-the-top but good. Although the pie was too sweet for me, all those layers did result in a very rich and complex pie. The Snickers melted a bit blurring the lines between the fudge layer and the creamy cheesecake layer. The recipe yields 12-16 servings, but I suggest cutting the pie slices even smaller. I cut my 9-inch pie into 20 slices. The slices were thin enough to pick up and eat without a fork and plate. Preheat oven to 350 degrees F. Butter a 9-inch deep-dish glass pie pan. Combine graham cracker crumbs and brown sugar in a mixing bowl. Add melted butter, stirring until well incorporated. Press mixture evenly onto the bottom and up the sides of prepared pan. Bake for 5 minutes, until crust is set. Transfer to a rack to cool. Keep the oven temperature at 350 degrees. Combine butter and bittersweet chocolate in the top of a double boiler; set over simmering water and stir until melted and smooth. Remove top insert and cool slightly. Sift together flour, cocoa powder, baking powder and salt into a mixing bowl. Set aside dry ingredients. Using an electric mixer, beat together sugar, egg and egg yolk in a large bowl for 1 minute, until slightly thickened. Add vanilla and cooled chocolate mixture and mix until well blended. Add dry ingredients and mix until just combined. Pour into crust. Bake for about 15 minutes, until a skewer inserted into the center comes out with moist batter still attached. If crust browns too quickly, cover with foil. Transfer pan to a rack and let cool for 10 minutes. Evenly arrange Snickers bars over the top. Using an electric mixer, beat together cream cheese and sugar in a mixing bowl until smooth. Add egg, egg white and vanilla and beat until smooth. Carefully spread mixture over the Snickers bars. Bake for 15 minutes, or until cream cheese is set. Transfer to a rack to cool. Combine chocolate and cream in the top of a double boiler. Set over simmering water and stir until chocolate is just melted and smooth. Remove from heat. Spread or drizzle decoratively over the pie. Refrigerate until well chilled. Serve cold. The pie may be prepared up to 3 days ahead. Cover loosely with foil and keep refrigerated. But I must say, your Snickers Pie would put ANY Sandra Lee recipe to shame - it looks devilishly delectable! Gorgeous looking pie! Never seen a Sandra Lee show, so for me, this is an original! OH MY! I just happened upon your blog and this pie looks incredible! I'll be right over with my coffee mug! Beautiful job. My 6 year old won a blue ribbon at the San Diego county Fair last summer in the kid's pie competition. His entry: Snicker's Bar Pie. Yes, his filling was a cool whip mixture with peanut butter and cream cheese. But it had snickers and caramel drizzled all over the top, and he DID make his own peanut butter crust! It was over-the-top sweet but they all loved it at the fair! Yours, of course, looks most delicious too! This looks so yummy - but how long did it take to make? I am always on the look out for yummy desserts that can be made in about 30 min or less. I think I will attempt to make it in stages. Oh my! My husband would be all over this...I have to make it for him! i love that your husband knows what's up! i also love that you called your pie "less not homemade." one more thing that i love is the idea of this pie--it sounds fantastic and definitely worth a try! Love the laughs about SL. very humorous! Gooey, creamy, crunchy... that is comfort food for sure!!! It sounds delicious to me!! It would be pretty impossible to truely do everything from scratch - I don't have a problem with you using store bought Snickers!! You may eat this wonderfully gorgeous pie, but you must sing the Sandra Lee Song afterwards. It is required. Sandra Lee doesn't hold a candlestick to anything that you make! I think there are so many people learning how to cook from watching the FoodNetwork that they actually think what SL does is homemade. I am not sure if this is a sad point or an okay one just for the fact that more and more people are actually steering away from eating out as much. Okay, enough philosophy, sorry. . .your pie looks rich, delicious, and definitely HOMEMADE! 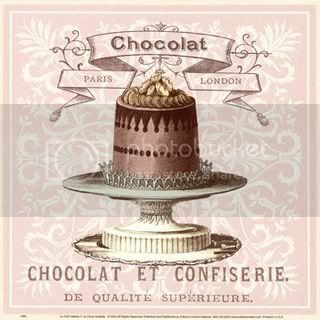 I would love to try making this but when I can share =D. I have tagged you..Hope you do not mind. Oh no, what a thing to say! You're so the opposite of Sandra Lee, that pie looks amazing! Just joking Mary, your pie looks delicious and of course you can call it homemade! We don't have SL here on tv - but from what I've heard of her, that isn't such a bad thing. We do have, however, tv 'chefs' using powdered mashed potatoes and the like. Which is probably just as bad. So craving a slice of that now! Snickers, Cheesecake and Fudge? Oh my, where the heck do I sign up to get one of these pies!? That is too funny! 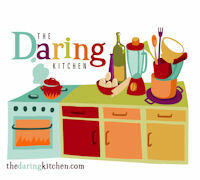 I also love to bake everything from scratch as much as possible and Sandra Lee is a little insulting to scratch cooks. 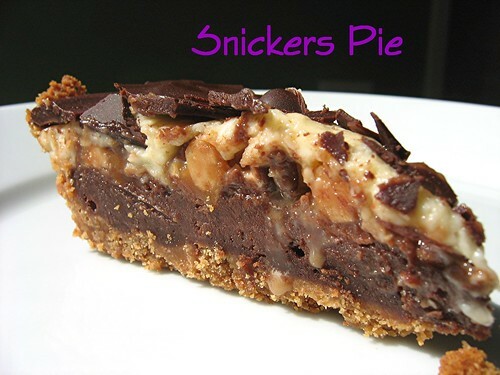 I would say your pie is as homemade as can be & it looks amazing, if only I liked snickers. Maybe I could sub butterfingers instead? I LOVE Pie and I LOOOOVE Snickers. I Love sandra Lee too. This dessert is to die for! So pretty! Snickers is my favorite candy bar....haven't had one in years. This looks so sinful....and YUMMY! Oh I love Snickers. Ill have to make one of these ... or maybe 2. Loved the sandra lee comment from your husband:) your pie looks great. did you make the fudge later out of a can of betty crocker chocolate frosting? no? then you're safe. if you're still not sure: were you three sheets to the wind while you were baking, or did you create a tablescape to display the pie? no? still safe. You are so not SL! Unless we live on a farm with cattle and a full garden, or make your own chocolate from beansnothing is truly "homemade"...flour milling anyone?!! we made this this weekend and it was YUMMY. super rich but yummy. thanks! She's a party girl, that Sandra Lee. That sounds really delicious...I'm printing it out right now. Wow Mary, that looks evil! And you and Sandra Lee? Never in the same sentence! ...no words I am going to faint. This looks amazing! I'm not an experienced baker so I was wondering if a store-bought graham cracker crust would work here? Oh!!! Snickers.... love them, I have to try this........ I think I must have a sweet tooth tonight, it might have something to with the fact I am trying not to eat sweet treats! ha,ha so I just drool over pics instead.its only temporary though. Too decadent for wordds. I want some now. I tried this pie weeks before I stumbled across this blog post. It was perhaps the most delicious thing ever to enter my mouth. When I found this, my jaw just dropped. TO THE STORE! Thank you. I've been looking for a good Snickers pie recipe for months. Thanks for having this up. BTW. Sandra Lee's show is called Semi-Homemade. Not Homemade. That means half homemade. If you are a homemade type of gal, that's good. But you shouldn't take offense to Sandra Lee or her show for being on the borderline of homemade/store-bought. Thanks for the recipe again. And here http://www.bbc.co.uk/food/recipes/database/snickerspie_80041.shtml is another version of the Snickers Pie, made with five bars and coming with a health warning! Hey, I hope you don't mind -- but I stole your photo and added a bookmark to it so that I can make money off of it on our blog. Thanks! I am sorry. Did I say bookmark? I meant watermark. That way people can't do what I did (steal it from you). Thank you for this recipe! My little brother loves snickers but we don't have graham crackers in Israel so I tried using caramel cookies in the crust and it was great.